After over a year of construction, Tall Hall is finally almost complete. The 10-story residence hall will contain 610 upperclassmen rooms and will contain almost every style of housing available at Belmont, from single-bedroom suites to 5-bedroom apartments. Rumors have been circulating campus about a penthouse on the top floor, but Residence Life Director Anthony Donovan wants students to know the larger top-floor apartment is not a penthouse, and was created largely to make the most of the space the building had, he said. There wasn’t enough space to put another apartment on the top floor of rooms Tall Hall, so instead, Belmont decided to take the room and split it across two floors. 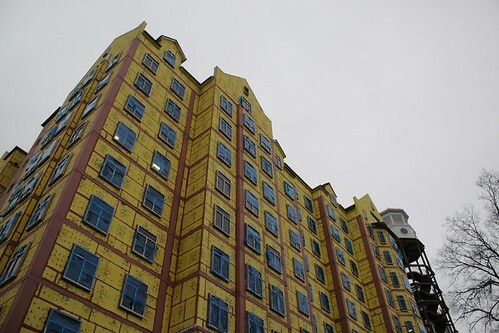 Two of the bedrooms in this apartment are on the tenth floor, while the other two rooms are located in the very top of Tall Hall alongside some of the building’s mechanical equipment, Donovan said. This apartment will contain living rooms on both of its floors along with two bathrooms and a staircase to connect the floors. This apartment will be slightly bigger than the others due to its unique placement, and because of this, it will be priced higher than the building’s other apartments at $5,500. While Donovan acknowledges students concerns, with some readjusting of current parking arrangements, students should all be able to find parking close to the hall they’re living in. Tall Hall will also contain a road connecting the Dickens Hall garage to the Hillside entrance to campus, meaning students will no longer need to use the Dickens access road to enter the Dickens garage, said Donovan. The building will also contain a fitness studio modeled after those in apartment complexes across the country. It will contain cardio equipment like treadmills and ellipticals. If you’re looking to use free weights, you’ll still have to make the trek to the Fitness and Recreation center, but for anyone looking to get in some quick cardio, this fitness studio will do the trick. Keeping in line with residence halls like Dickens and Russell, Tall Hall will also contain a communal laundry facility, with more washers and dryers than Patton Hall, which service the same number of students as Tall Hall combined. While there’s plenty left to do before Tall Hall is complete, the suite-style half is slated to open in August, with the apartment-style half opening shortly after January of 2019.